This October, we are all being asked to ‘Make A Difference’ and what better way to do so than by volunteering with the Coastguard Rescue Service. ‘Make A Difference’ is a month long campaign by the charity Community Service Volunteers (CSV) to encourage more people to volunteer. Her Majesty’s Coastguard is the emergency service responsible for coordinating maritime search and rescue in the UK. 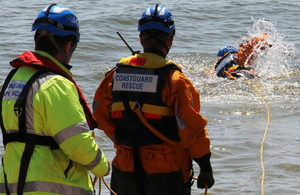 One rescue resource often called into action is the Coastguard Rescue Teams. There are 347 of these teams in the UK, made up of more than 3,200 volunteers. The Redcar, Robin Hood’s Bay, Skinningrove, Staithes and Whitby teams are currently looking for new recruits. In the past year, the teams have collectively been involved in more than 200 incidents, ranging from capsized boats to people stuck on cliffs and water rescues. Coastguard Rescue Officers are on call 24 hours a day, 365 days a year, ready to respond at a moment’s notice. They’re trained in first aid and a variety of rescue techniques, from water, mud, rope and cliff rescues, to search methods and assisting helicopter operations. People across Yorkshire are privileged to have these rescue teams which form an integral part of their communities. They respond to callouts every day of the year, in all weathers and often at unsocial hours to assist people in distress. You’ll be given regular training, and all we ask in return is that you are situated within 20 minutes of the Coastguard base, and be available to respond at most times. But it’s not just rescues that the teams get involved with. As a Coastguard Rescue Officer, you may also spend time educating people in coastal safety. This preventative work includes visiting schools and shows as well as patrolling the coast to advise people of the dangers. Since becoming a Coastguard Rescue Officer I have found that my life has been enhanced in a number of ways. Of course there is a lot of commitment needed at times. When you are sitting down to Christmas dinner and the pager goes off then you have to go. If you are fast asleep at 3am and the pager goes off, again we just go. However, the positive side of that commitment is the feeling that you have achieved something and are making a difference, however large or small, to people who need our help. It definitely changes you as a person. There’s a greater sense of self-worth from very early on. I would highly recommend joining. For more information, please email Chris Coulter chris.coulter@mcga.gov.uk or telephone 01947 602 107.